Heee ! Heee ! 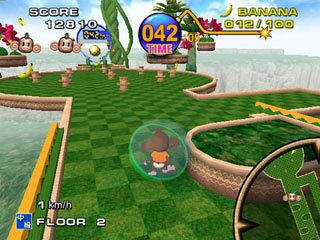 Uuu.. Uuu..
"Sega's Super Monkey Ball for Nintendo GameCube will keep you rolling! Tilt the stages just right and your monkey will zip down ramps, launch across a vast ocean, and maneuver through party games galore. 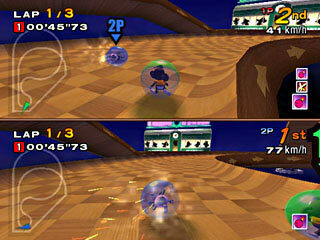 Because they inhabit a transparent ball, the four versatile monkeys can act as a bowling ball (with pretty impressive spin), golf ball, and billiard ball. And the party doesn't end there! 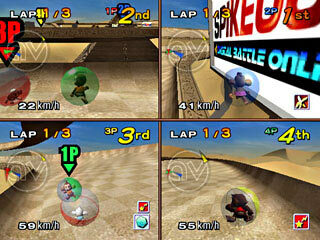 Engage in a variety of competitive races in Monkey Race, boxing in Monkey Fight, and flying in Monkey Target. While you plunge through the various beautiful stages that float high above deep canyons, the clock is running down, so don't take your time negotiating those corners. 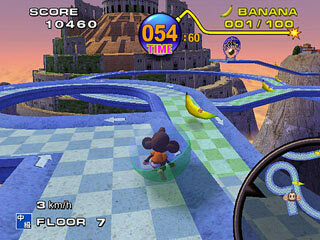 If you fall off the side, all is not lost; simply scoop up more bananas and once you collect 100, you get another life! 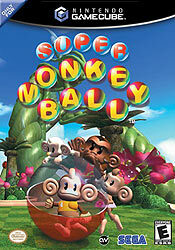 As with most monkeys, AiAi, MeeMee, Baby, and Gongon love to play -- and in this case, win! Bring them to victory and you will be treated to their dance of glory." "- Extensive game play for 1 to 4 players. 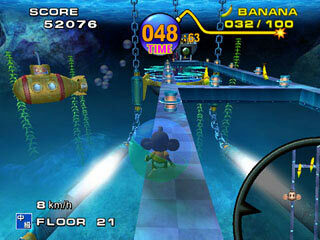 - 10 Beginner stages, 30 Normal stages, 50 Advanced stages, and special hidden bonus stages. - Bright, upbeat music that changes with the diverse environments. 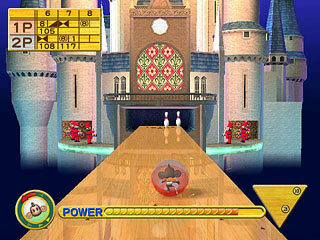 - Simple controls get beginner gamers right into the game. - Adorable, heart-stealing characters make gameplay addictive. - Track your progress with Play Points and Rankings. 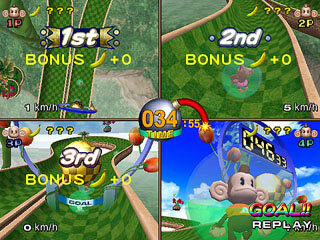 - 6 Extra Modes of play include: Monkey Race, Monkey Fight, Monkey Target, Monkey Bowling, Monkey Billiards, and Monkey Golf!"